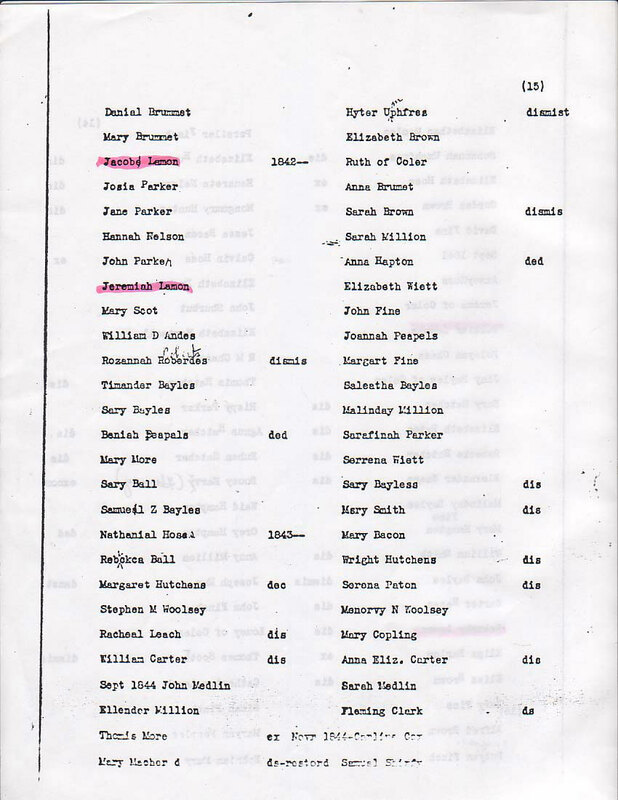 See the Abraham Hiestand timeline for much more information on this Hiestand/Heaston/Haston family. These records are available on microfilm from the Tennessee State Library and Archives (TSLA). Mf. 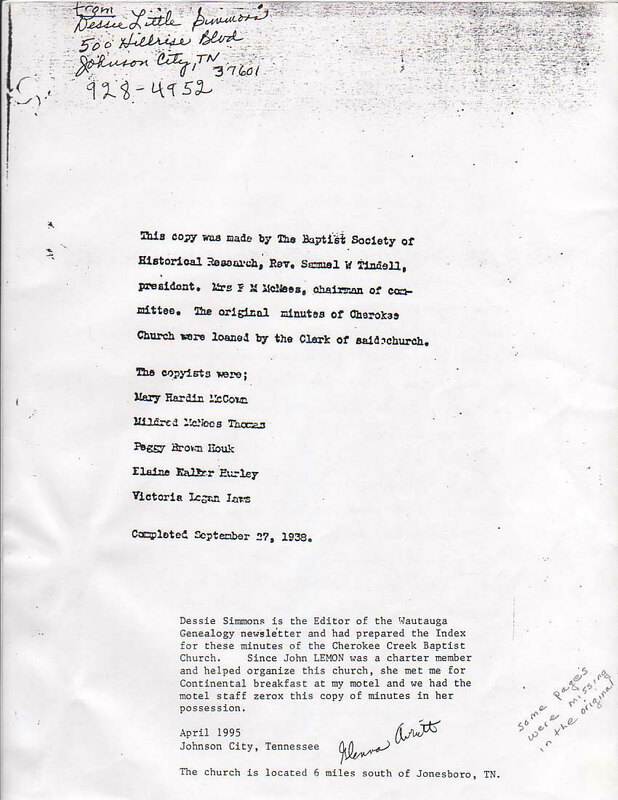 523 -- Cherokee Baptist Church Records. Jonesboro, 1787-1923. 3 vols. TSLA. 1 reel. 35 mm. Microfilm Only Collection. 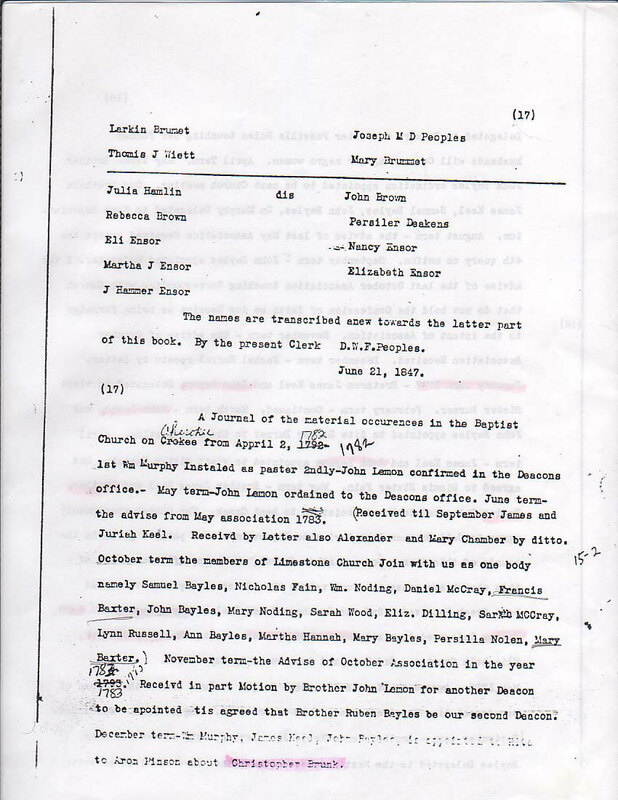 Records of Cherokee Baptist Church, consisting of minutes, 1787-1923; and lists of members, clerks, ministers, deacons, and deaths for this Washington County church. Note: James Ryan joined at this same time. *Note: Abraham's wife, Magdalene, died prior to 1801. 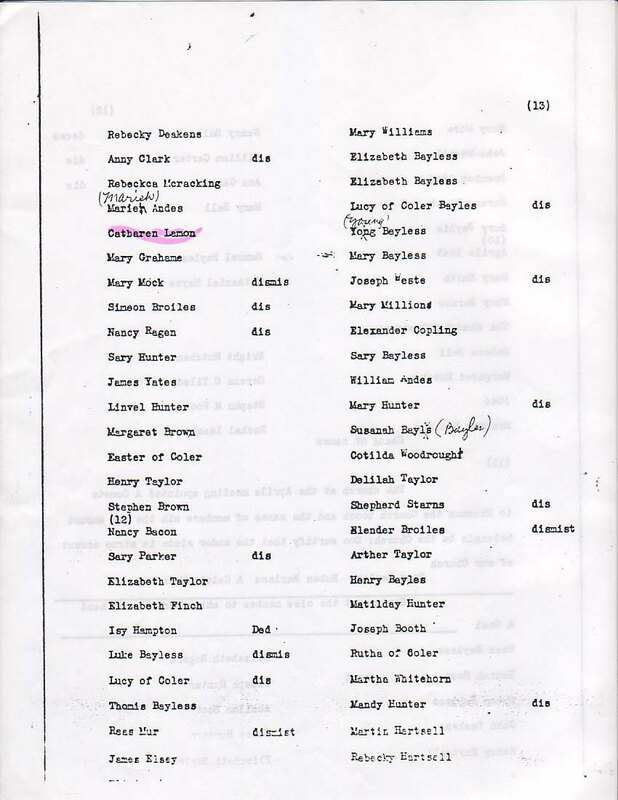 Perhaps all of the references to Magdalene in the Cherokee and/or Big Pigeon church minutes were references to Abraham's daughter. It is possible that she could died prior to family's membership in these churches. Some of these "comings and goings" dates and names don't seem to make sense, but this is the way the record appears to be. These documents are faded and worn, so there may be additional Haston-related information in these documents that can not be clearly or easily read. Records indicate that Abraham Histon/Hasten/Hastings/Hayston was buying and being taxed for land in Washington County, NC (now TN) in 1785 - 1787. 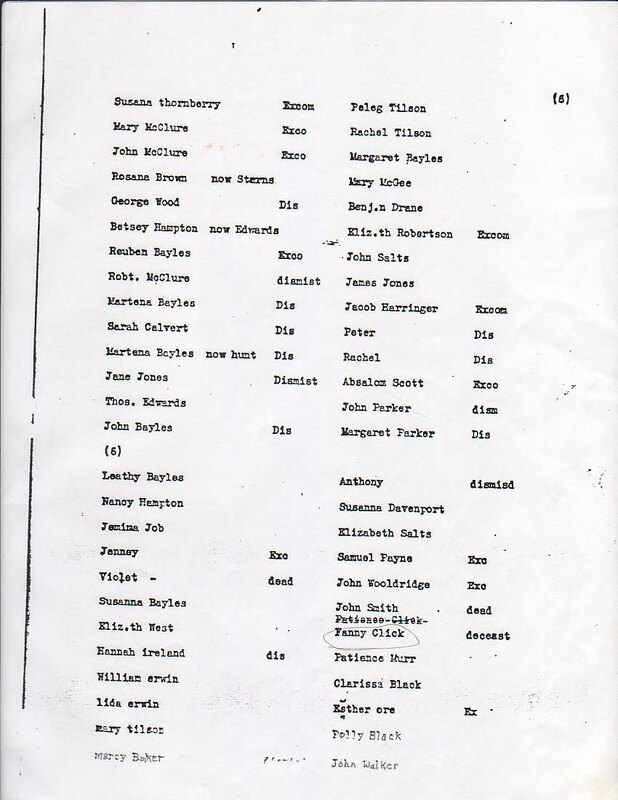 Abrm/ Hastings (and Saml Hastings) are on a early east TN list of taxpayers in 1787 as landholders in Washington County, TN. 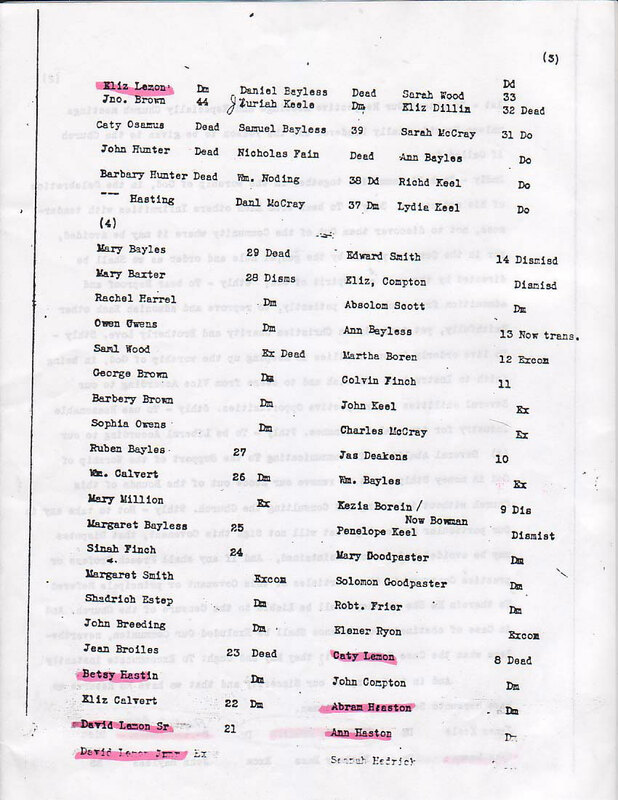 Also, Danl Haston is on the same list but did not own any land. He does appear to be in a separate household. 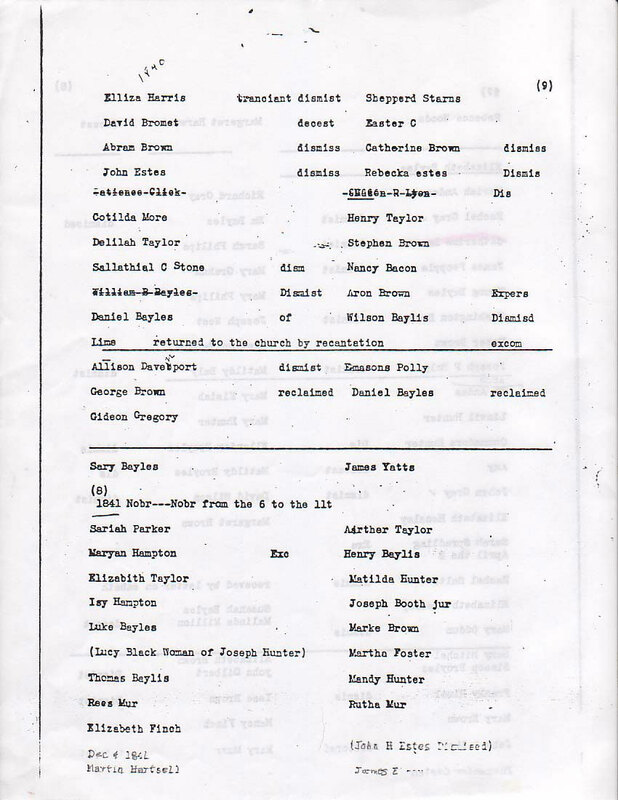 It appears that the Haston family members left Washington County and then went to Cocke County, where they affiliated with the Big Pigeon Baptist Church. 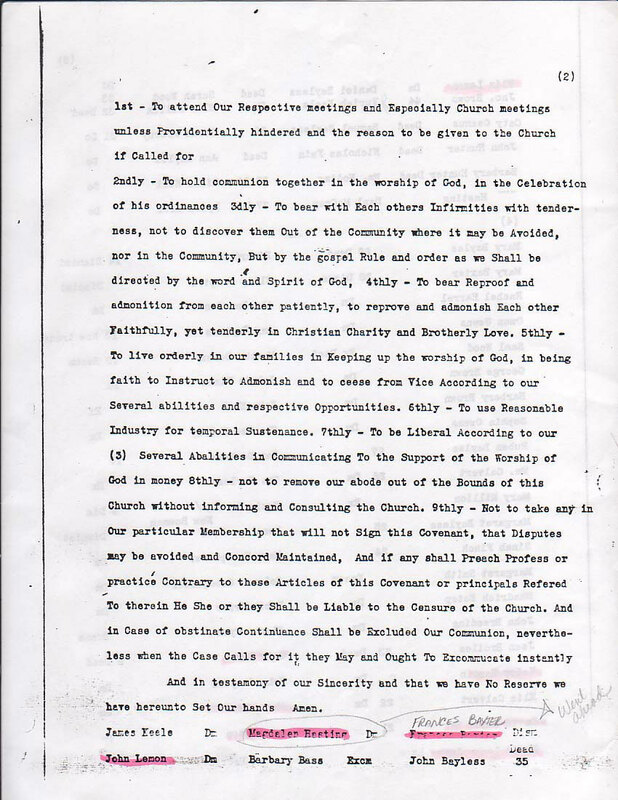 The John Lemon shown in the Cherokee Baptist Church minutes as a charter member, signing along with his wife, Elizabeth, on 6 Sep 1783, is Lemmon's Bend John (John Sr.). It is believed that he is also the John Lemon ordained as a deacon. Lemmon's Bend John first owned land in Washington Co TN, along Cherokee Creek purchased 10 Nov 1784 NC #573 - 150 acres "including the plantation where Aron Pinson formerly lived." John Lemon Jr. m Magdalene Hiestand 1791 in Washington Co TN--their oldest son John O/Q Lemmon was b 25 Feb 1792 in Washington Co TN. "John Leamon TO Charles Robinson; 3 tracts totaling 220 acres on Cherokee Creek, next to his other land. CONS: 200 lbs. ADJ: David Hofman, John Mc(kaeavres?). John Marey. SIG: John X Leamon. WIT: Samuel Hecstand [Hiestand], J Tadlock, George French. CT: Feb. 1792." Source: Page 101 (date: 9/13/1791) of Washington County, Tennessee. Deeds, 1775-1800 by Loraine Rae. Note: This is interesting, since a Daniel Heaston was a church member just a couple of years earlier in Cherokee Baptist. Assuming that this is the same Daniel, why was he required to join "by experience," since he had been properly dismissed from the Cherokee Creek Baptist Church in February of 1792. Perhaps it is because he had been inactive as a church member for two years, since the time he left the Cherokee Creek church. Question: Abraham's son, Daniel, supposedly was married on November 7, 1793 (although we do not have primary documentation for that). 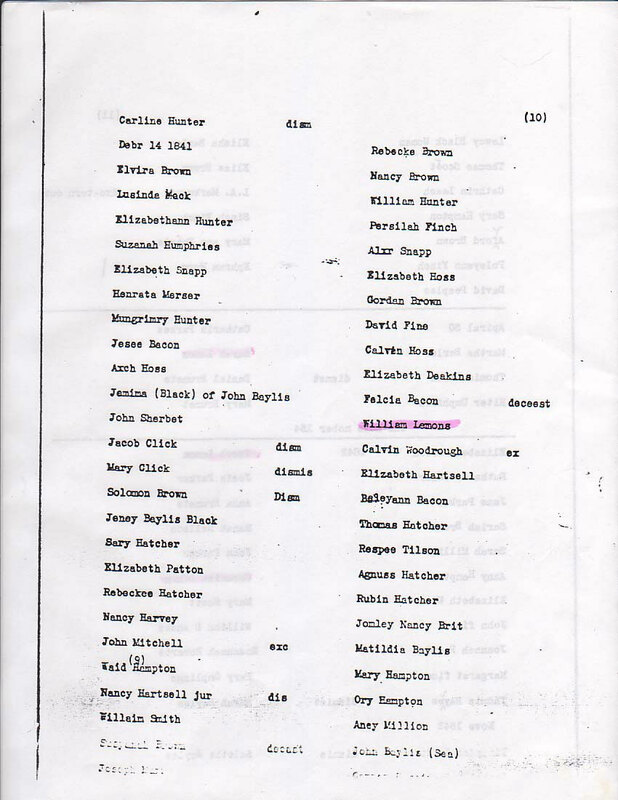 Why does his wife, Elizabeth Mosier, not join the church with him nor show up in the church records subsequent to this time? From here, this Haston family moved to south central Kentucky. 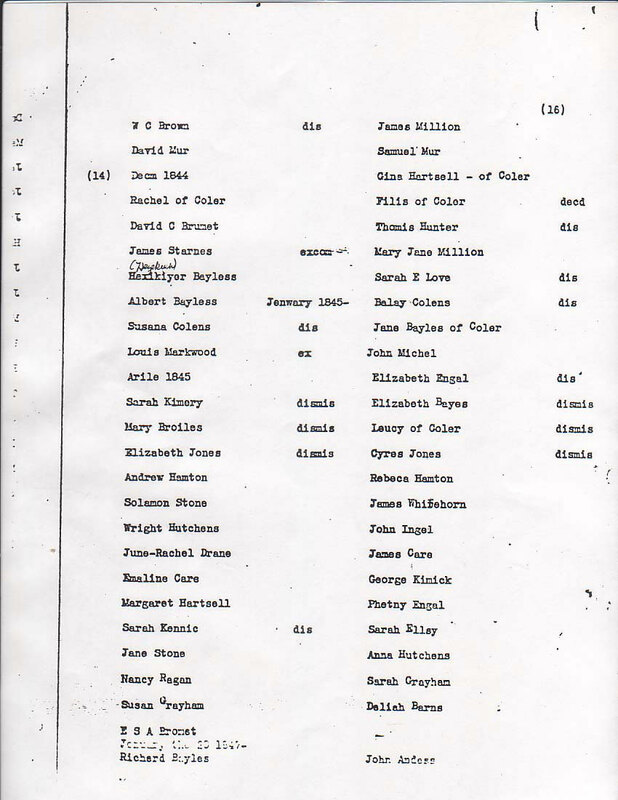 Some of these names show up on Monroe County, KY genealogical and church records. See the comments regarding the Abraham Haston and the Daniel Haston who went to south central Kentucky. These comments appear in the Stockton Valley Association minutes and are included in the Big Fork Baptist Church section of this site. John Lemon was ordained as a deacon on April 2, in what appears to have been 1786. Note: A person who had been excluded from a church could be "received [back into the fellowship] by recantation." This would suggest that this Daniel Heaston had been excluded ("kicked out") from this church or another church of like faith and practice. Abraham's son, Daniel Heaston, would only have been about 20 years and 6 months old at this time. Hanny B. 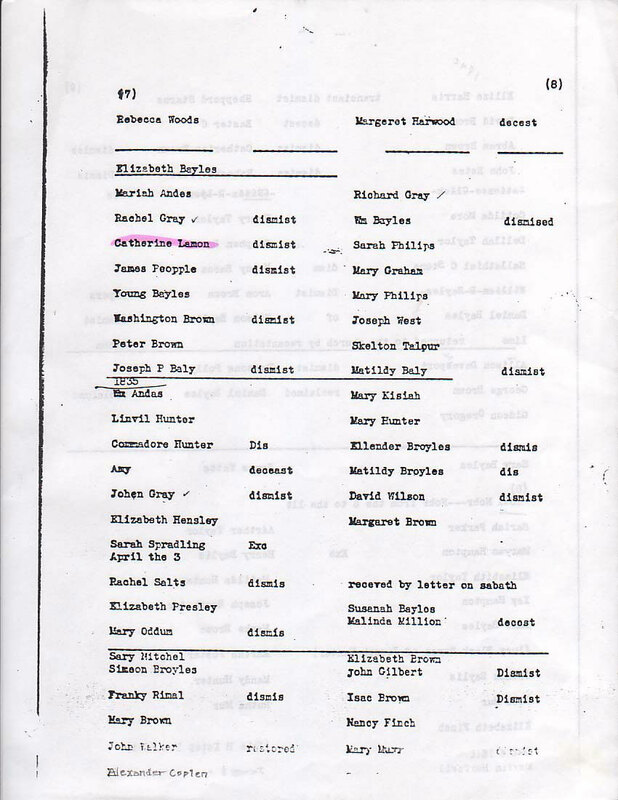 (probable daughter) & James Ryon received by baptism on the very same day of April 1791 (and back to back in a list of church joiners) in which Daniel Heaston was received into this church's membership. Elenor Ryon, wife of James, was received by experience a couple of years later (March 1793). This reference may be a very important clue for Haston researchers. See the rationale for this possible research clue at the bottom of this page. Abram Heaston (probably Sr.) was dismissed in May of 1792. Elener Ryon was received by experience in March of 1793. She was Eleanor McComisky Ryon/Ryan, wife of James Ryan & the daughter of Daniel McComisky of Baltimore, MD. James Ryon declared himself openly in the church that he believed in Presbyterianism as to infant baptism on September 3, 1796. 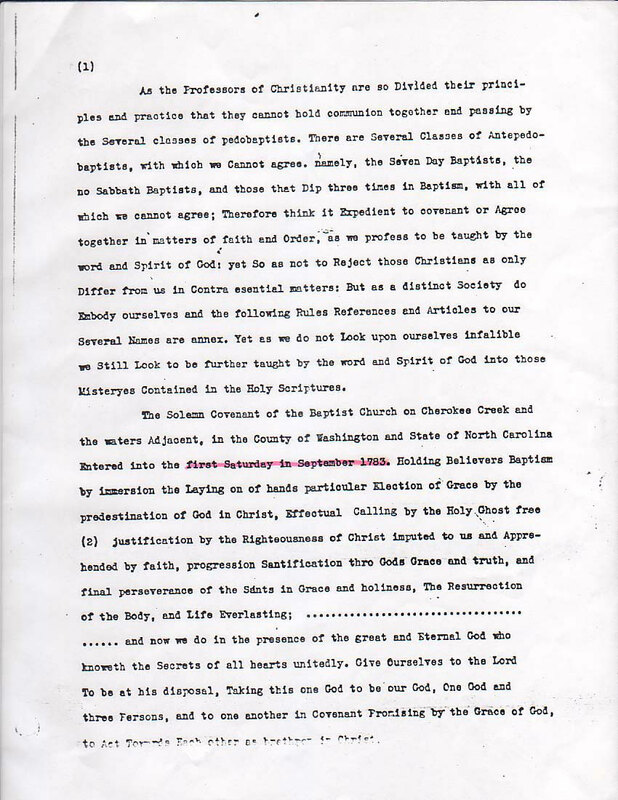 The Ryons were "cited" on October 1, 1796 because they withdrew from the church. Daniel Haston family who lived in Knox County, TN (mid-1790s to early 1800s) and later in White County, TN (from about 1804 to his death in 1816). It has long been known that there were two "Daniel H." men, with the same or very similar surnames, who lived at the same time (1780s and 1790s) in the general area that became east Tennessee. Many Haston researchers have assumed that the Daniel Haston of Knox and White Counties was the brother of Abraham Heaston (both being sons of Heinrich Hiestend), who had a son by the name of Daniel. However, no documented proof of that relationship has surfaced. James and Eleanor Ryon/Ryan provide a common link between these two families. We know that Abraham Hiestend/Haston and his family were members of the Cherokee Baptist Church in the 1790s. James Ryon (and "Hanny B." 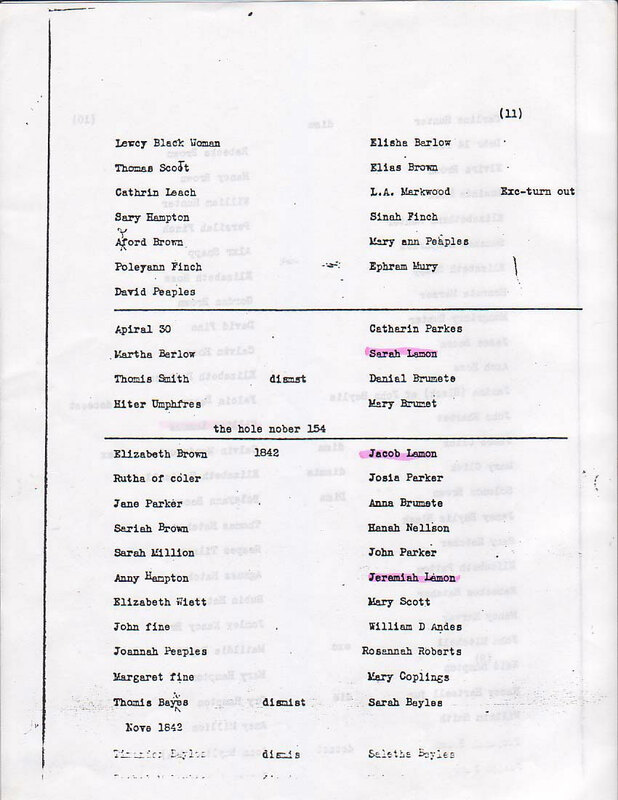 who was probably his daughter or perhaps his mother) joined the Cherokee Baptist Church at the same time that Daniel Heaston (probably the son of Abraham Hiestend/Heaston) joined. 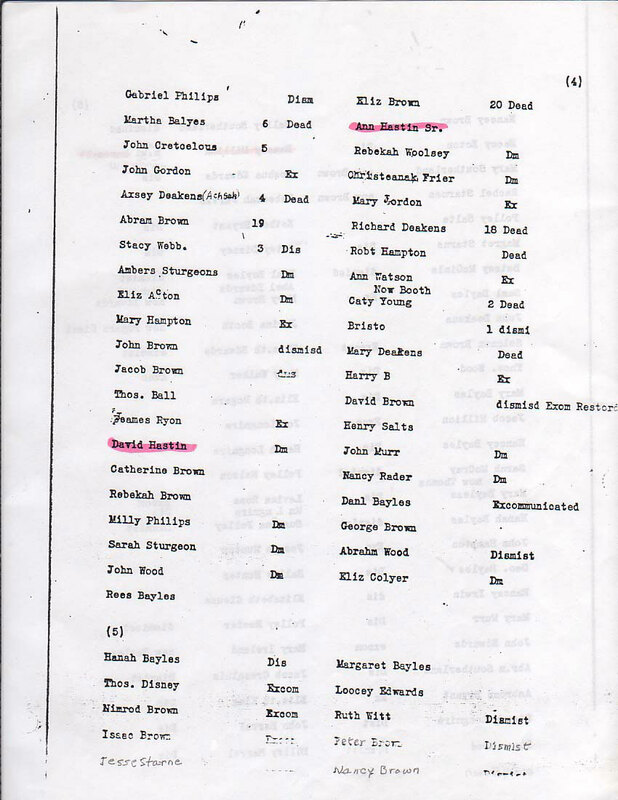 James Ryan and Daniel Heaston certainly were acquaintances, but the fact that they were back-to-back on the list of joiners, may indicate that they were close friends or kin. See their April 1791 entries in the timeline above. 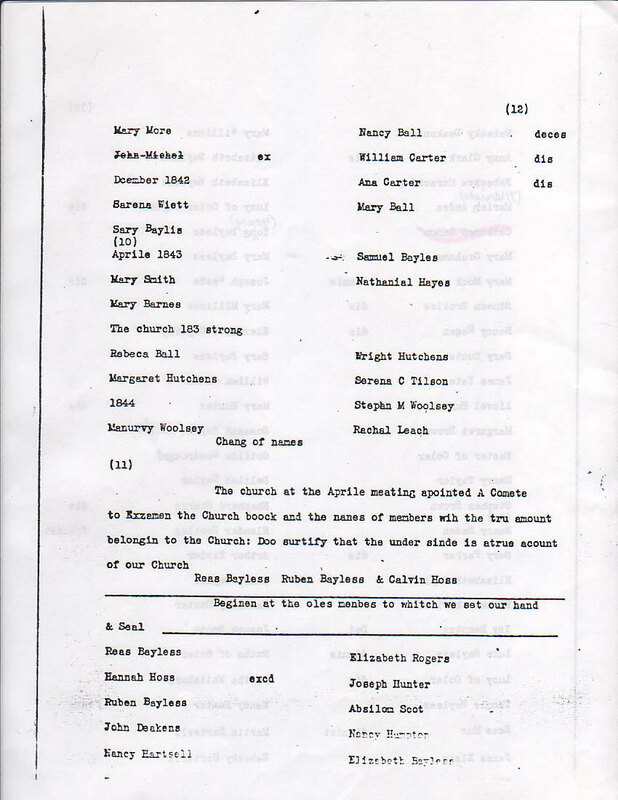 This James Ryan/Ryon (whose wife "Elenor" is mentioned in the church minutes) was almost certainly the same man who married Eleanor McComiskey, daughter of Daniel McComiskey of Baltimore County, MD. 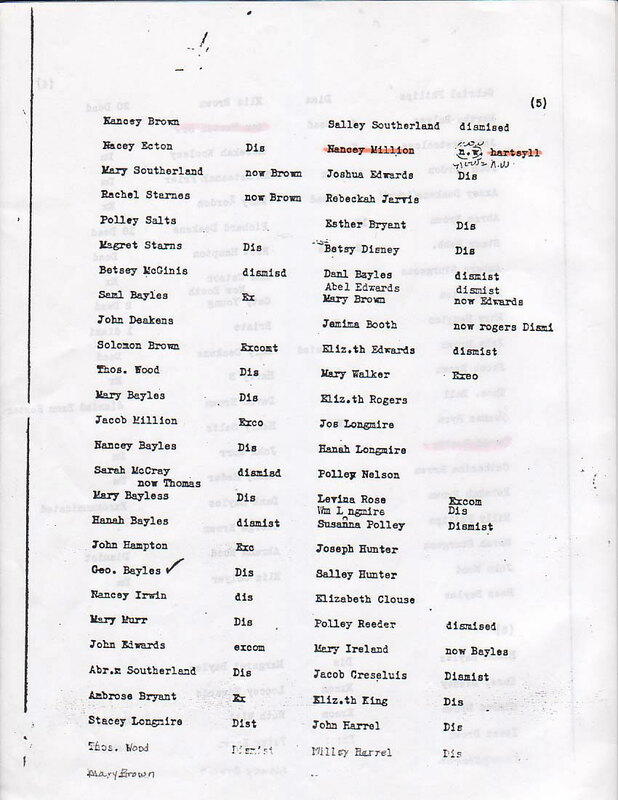 One of Eleanor's sisters was Mary, who married a Philip Roddy, who lived (and probably died) in Knox County, TN in the 1790s and had various connections with the Daniel Haston of Knox and White counties. Philip and Mary McComiskey Roddy may have been the parents of Margaret Roddy, the wife of David Haston, son of the Daniel Haston of Knox and White counties. This Ryan-McComiskey-Roddy-Haston connection is a bit complex, but it is unraveled on another page of this website. 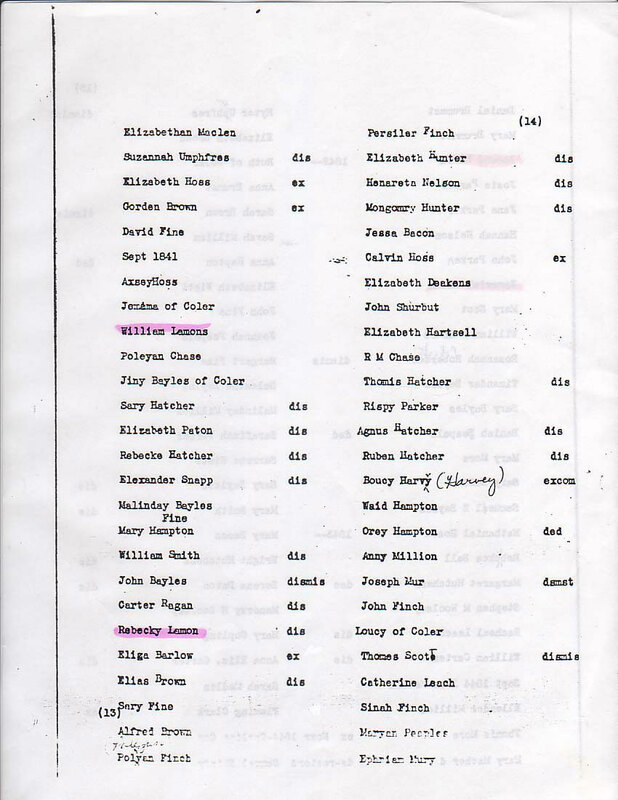 Although the James Ryan connection, as a common denominator for the two Haston/Heaston families, is not "proof" of their kinship relationship, it does provide strong circumstantial evidence that Daniel Haston (of Knox and White counties) was closely related to Abraham Hiestend/Heaston.